Restrict settings for opening, saving, printing, and even timers. In public access environments, you can easily keep machines free of personal data, while controlling what information comes in or out by disabling USB and disk drives. And built-in session timers help you ensure that everyone gets a turn. Browser restrictions allow you to control what users can do on the Web. You can disable features within Internet Explorer and Mozilla Firefox. You can also freeze the homepage and prevent changes. Or you can create a list of allowed or restricted websites to ensure end users are using the computers for the intended purpose. Enterprise-level control is easy using the built-in Faronics Core Console. It makes it easy to deploy, configure and manage WINSelect across your network. You can schedule and execute tasks using groups and even apply configuration changes when workstations are powered off. You can even schedule WINSelect restriction times and levels to meet the demands of your unique environment. Cloud control is offered with this Software as a Service (SaaS). Your local workstations can be managed from the Cloud with no need for a local server to host Core Console. Sometimes end users can get into trouble unintentionally – creating more IT support tickets. Trying to implement acceptable use policies can be practically impossible and that’s where the danger lies. But here’s an easy solution. Faronics WINSelect helps you to lockdown computers easily and quickly. It’s a synch to create the right settings for your enterprise. Now you can control everything from web browsing restrictions, Microsoft Office functionality, and even set timing restrictions. When you’re working in a public access environment, it’s really handy to be able to restrict saving, printing, and which applications can run. Faronics WINSelect even let’s you create session timers so that everyone gets a turn. It also let’s you restrict control panels, desktop icons, and even the start button functionality. And when it comes to safeguarding trusted information and customer lists, you can disable USB ports and disk drives to stop information from walking out the door. It’s great for kiosk environments too where you can automatically launch specified applications upon start-up and restrict everything else. The best part is that it’s just one click! With Faronics WINSelect you can eliminate those pesky troubleshooting emergencies to fix machines gone awry. This helps you to look like an IT superstar because machines are always available and working as intended, while you can reclaim your time and focus on other strategic projects. Standardised user environments are critical for organizations that want to reduce IT support costs and workload. 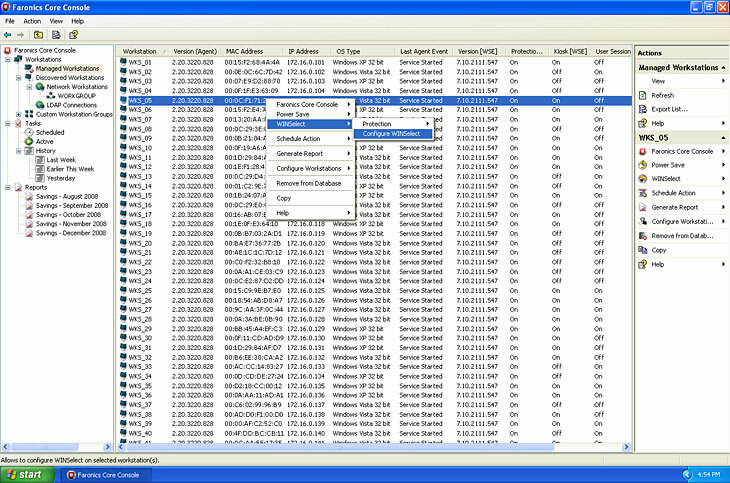 Faronics WINSelect provides a quick, flexible, and scalable way to configure the functionality and feature set of any Windows computer to conform to an organization's requirements. WINSelect also complements, manages, extends, and often replaces Group Policy Objects (GPO). It works alongside existing policies and delivers features and capabilities not offered by GPOs. WINSelect is also an easy to use GPO alternative for those that want to customise or lockdown computers, but do not have the time and training to use Group Policies or lack an Active Directory structure. WINSelect is an easy to use alternative to Group Policy Objects. Instead of investing the time and training required to understand and manage GPOs, organisations can use WINSelect to customise or lockdown computers through an intuitive and non-technical interface. Many of the common customisations that Group Policy Objects are traditionally used for are also found in WINSelect, such as modifying Start button functionality, enforcing Windows Explorer restrictions, and limiting right-click functionality. By using WINSelect, you can create the same tailored computing environment as a Group Policy Guru, but in a fraction of the time and effort. Many organisations rely exclusively on Group Policy objects to customise or lockdown their computing environments, but there are limitations to this model. GPOs lack the flexibility to allow for differing levels of security and permissions within multiple areas of an organisation. Network environments that are decentralised or lack an Active Directory environment make managing and enforcing Group Policies especially troublesome. Not only is WINSelect easy to manage, flexible, and scalable, it also works alongside Group Policy Objects to extend customisation capabilities beyond the level achievable by each method individually. In fact, WINSelect provides the ability to import, edit, and manage Group Policy settings through the use of ADM templates. In this way, WINSelect can employ GPOs in areas where they work well and pickup where GPOs fall short. WINSelect takes system and application customisation to the next level by providing capabilities that are not possible via Group Policy Objects. Selective desktop icon hiding, drive hiding, file extension blocking, and disabling of folder manipulation, drag and drop, and right clicks on the Start menu are just some examples of the desktop customisation features exclusive to WINSelect. Network restrictions include the ability to create a website white list or black list, while printer controls can block access to all or select printers and enforce print quotas. In fact, WINSelect can customise more than just the system settings and functions; it can even remove menu items and prevent right clicks within Microsoft Internet Explorer, Mozilla Firefox, Microsoft Office, as well as third-party Windows applications. By scanning the menu options of a selected application, WINSelect enables the removal of nearly every menu item. Whether you are a novice user or a Group Policy Guru, WINSelect will heighten your system control options above and beyond what you have today.